This is the third article in our series examining 19th Century war games designed and published primarily but not exclusively for the use of professional armies. The previous articles (here and here) discussed von Reisswitz’ Prussian Kriegsspiel (1824) and W.R. Livermore’s American Kriegsspiel (1882), respectively. This time, we look at Charles Totten’s Strategos, a contemporary design to Livermore’s game. “Charles Adelle Lewis Totten, 1873.” Photo courtesy of the USMA Special Collections & Archives. 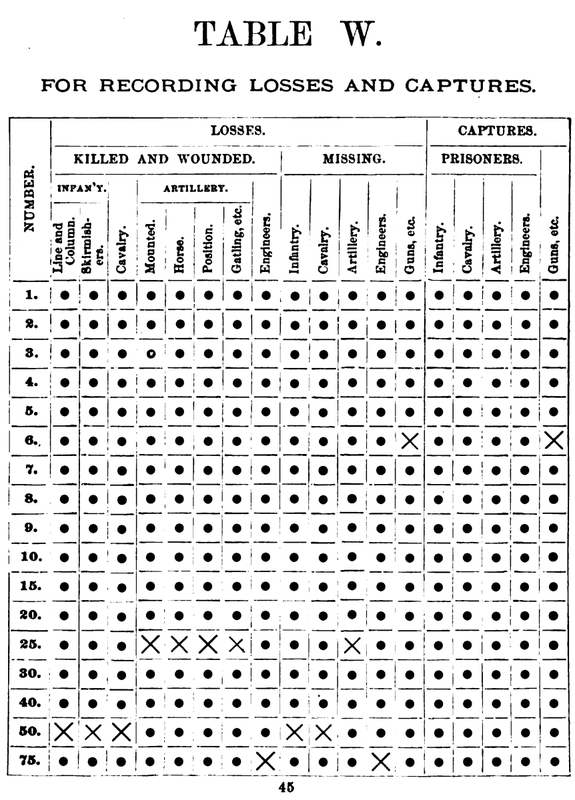 In 1880 D. Appleton and Company of New York and then-First Lieutenant Charles A. Totten, (Fourth Artillery, United States Army), published STRATEGOS: A Series of American Games of War Based Upon Military Principles and Designed for the Assistance Both of Beginners and Advanced Students in Prosecuting the Whole Study of Tactics, Grand Tactics, Strategy, Military History, and The Various Operations of War. Strategos presented a layered set of games that addressed tactics, grand tactics, and strategy, supplemented by material for the study of military history, with an appendix that included statistical studies relating to the conduct of war. 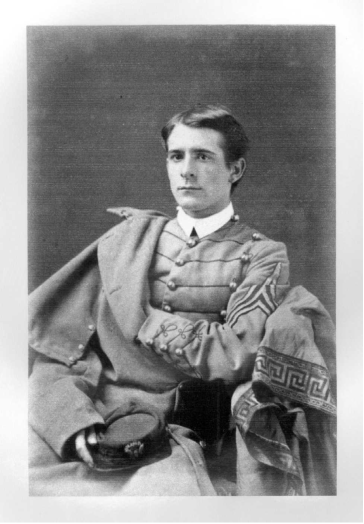 Like his rival Walter Livermore (Class of 1865), Charles A. Lewis Totten graduated from the US Military Academy at West Point (Class of 1873). His father was Brigadier General James Totten (Class of 1841) and his uncle was Joseph Gilbert Totten (Class of 1805). Charles Totten ranked among the top ten cadets of his graduating class. His first posting, as a Second Lieutenant, was to the 4th Artillery and the garrison at Alcatraz Island, California, one of the forts protecting America’s Pacific Coast. His subsequent career included similar posts such as Fort Monroe, Virginia and the Artillery School there, and the Presidio in San Francisco. Other assignments were as Professor of Military Science and Tactics at the Massachusetts Agricultural College (now the University of Massachusetts) and later at Yale University, and as an instructor at West Point. Totten is still remembered in Massachusetts for his contributions as a founder of the fencing program while he was at Massachusetts Agricultural College. His field service included the Bannock Campaign (1878) and the Chiricahua Campaign (1880-1881). During his military career he also published “Compensating Powder for Heavy Artillery” (1877), “Text Books and Tables”, and “Instructions in Guard Duty” (1887). His military lectures at Yale, including “Military Economy and the Policy of America” and “Organization, Dis-organization, Re-organization, and Mobilization” are available in a bound collection held in the Yale University Library. He resigned his commission and left the army in September, 1893. His post-Army life reflected his interest in what was called Christian Zionism and he wrote extensively on history as reflected in the Bible and associated texts. He died on April 22, 1908, at Milford, Connecticut at the age of 57. Members of the Totten family have continued the tradition of military service up to our present time. The preface to Totten’s Strategos presented a summary history of the war game, emphasizing the similarities and links amongst all previous known 19th Century war games. His survey included the older German kriegsspiels and Totten appears to have captured many of these early attempts among the almost 30 titles listed. 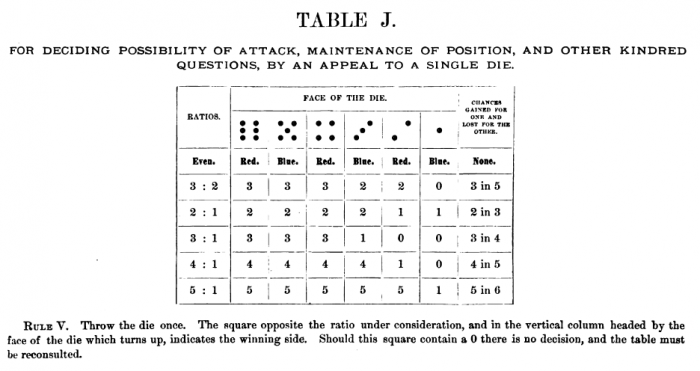 Despite this evidence of broad and thorough research, Totten claimed that Strategos was a unique and independently designed war game, “the result of several years of private study, unassisted by reference to any foreign code until it had become a finished system” arising in part from his “inability to obtain copies of any foreign war game.” He also mentioned a test play of his game at West Point which must have made him aware of the somewhat longstanding war game activity there which included early versions of Livermore’s game. A “more minute analysis” of actual conflict and greater accuracy in the system tables used to resolve conflicts in the game. Their conclusion recommended acquisition of Strategos and its apparatus for the army, although it is not clear whether it was ever actually acquired on any large scale. I have tentatively identified only one surviving apparatus out of the perhaps as many as 200 sold, offered several years ago for $7,500 by a dealer in New York. It is perhaps worth noting that three of the five named members of that board were from Totten’s own unit – the 4th Artillery, one of them his colonel, though we can only speculate how that may have influenced the board’s recommendation. Strategos: The Advanced Game can be played using one, two, or three maps depending upon the overall situation being depicted and the physical circumstances of the playing venue. A single map can be used if screened or masked suitably when examined by either Player-Commander. A trial game played at West Point reportedly used a 6” scale map arbitrarily interpreted as being a 10” scale map with appropriate adjustments to the firing ranges and tables for play. Totten also suggested that a “Siege Game” might be played with the same apparatus using an enlargement of the fortress plans from The Annals of a Fortress by Violet le Duc. 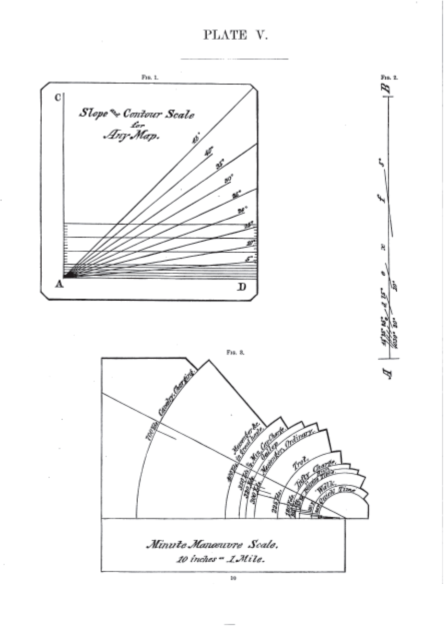 He noted that a pantograph would also prove useful in scaling maps to work with the rules and for making copies as needed of the desired maps. Format 123 page book 1 Volume book with Atlas 1 volume book, 2nd volume of appendices, plates, tables, etc. The larger playing pieces made of wood represented Line units or Train/Baggage units. The smaller pasteboard pieces were for skirmishers and other small detachments. All of them had a “slate-silicate” surface that allowed the Referee to mark on them with a pencil such information as unit identification, branch of service, etc. as appropriate to a scenario. The artillery battery and half-battery pieces could also be distinguished as having 12-pounders, 3” rifles, Gatling guns, Hotchkiss Rotating cannon, or other weapons. W – Wagons, Baggage, etc. The 24 pieces representing Stands of Colors in The Battle Game can be used in The Advanced Game to represent signal stations, bases of operations, etc. As in the other games we have examined, the playing pieces could be positioned on the map in various ways to indicate whether the troops were in line, line of battle, column, etc. The 96 Tactical and Topographical Blocks had the same slate-silicate surface on one side (and in some cases the other side was divided into a red half and a blue half or even left blank, allowing them to be used to represent higher echelon troop units). The blank surfaces could be written upon in pencil with military topographical symbols to indicate different terrain types – rivers, swamps, lakes, woods, mountains, villages, etc. Since the total area coverage of the blocks provided was less than three square feet, it seems probable that they were to be used to indicate only key features surrounded by otherwise open flat ground and not by themselves to create and entire gaming surface. The blocks could also be used with the four 20 by 24 inch white-slate surfaced folding game boards included in the apparatus. The four boards provided a total surface area of 48 by 40 inches in which the topographical blocks could be effectively used. Colored chalk might also be used to transform the surface of the four boards into a sketch map. The surface would allow the Referee to make notes as play of the game proceeded, both for his own reference and as a record from which to compile a complete account of the game afterwards. The apparatus provided one dice-box, three six-sided dice, and one 12-sided teetotum (a top-like device for use like a die), for use in connection with the various tables found in the rules. Several pairs of tweezers or holders were included for use in moving the playing pieces. It was specifically recommended in the rules that the playing pieces be handled as little as possible to minimize damage and wear to the slate surface. 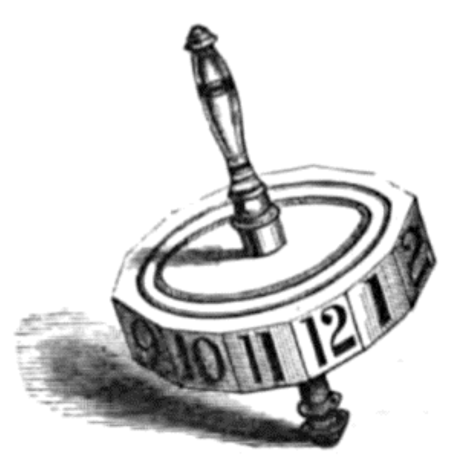 Strategos included mounted reference aids, such as “Table B.—For Recording Game Intervals in Time”, on blocks of soft wood. For “Table B”, the black pins provided in the apparatus were placed to indicate the starting month, day, hour, etc. of any game and white pins recorded the passage of time in the game. As noted, the Referee regulated the length of turns with his announcement at the beginning of each new turn as well as the end of any further movements or corrections to the move in the previous turn. The first step was to identify the Referee and then choose the two Player-Commanders. The Player-Commanders then alternated in turn to pick from the remaining players to assemble their team. and placed the instructions in sealed envelopes. To begin actual play , the two Player-Commanders each rolled a single die for the right to choose first from the two envelopes. This meant that they would only know what forces they would command and what situation they would face when they opened their respective envelopes. Once the envelopes had been opened, either in separate rooms or behind screens, the Referee or his assistants would make the appropriate disposition of unit pieces and other counters on the respective maps. The Player-Commanders could consult with any team member considered to be at the headquarters and not at some other position on the map. The positions of all players with command roles in the game would be indicated by pieces bearing their names placed on the maps at the indicated points by the Referee’s assistants. Once the plans are completed, the Player-Commanders presented them to the Referee. This preparation allowed each Player-Commander to fully appreciate the military situation while his description of that understanding and his plans would guide the Referee in conducting the game. The Referee likewise took the written orders from the two Player-Commanders and used his map to determine whether the orders could be carried out as written. The Referee relayed to each Player-Commander any information or further orders generated as a result of this review while an assistant executed the actual movement and placement of pieces on each Player-Commander’s map. Only the Referee and his assistants had access to all three maps (when used) while only the Referee’s map showed all the pieces representing both forces in their precise locations. The two Player-Commanders and any subordinates were allowed access only to their own map. During the game, only the Referee or assistants placed or moved playing pieces on any of the maps, in accordance with the orders of the players and the decisions of the Referee. Pieces representing enemy units were placed upon each Player-Commander’s map only when the Referee judged that such units had come into the view of friendly units. The rules encouraged the Referee to carefully control this process so that the opposing commander saw at first only the indication of the presence of enemy forces and improved upon this knowledge only as he maneuvered his own forces in response to the enemy’s presence. Communications between players were strictly limited and the two Player-Commanders were allowed to consult only with any of their team members considered to be at the headquarters and not at some other position on the map. In this latter case, they would be limited to written communications transmitted via the Referee. Some information was provided to the players at the beginning of the game in the briefing on the scenario and on general intelligence information. As the situation developed the Referee continued to convey information to the players regarding changes and events. Players also obtained information by examining the map, being allowed to see those units of the enemy that the Referee had concluded could be seen by his units or when reports from his subordinate commanders reached him via couriers (the Referee or an assistant controlled the movement of couriers, messengers, etc.) or when meeting “fact-to-face” on the map. Examining his own units, the player could determine their current strength, their level of fatigue, and possibly their level of ammunition supply reflected in the pencil markings on the unit pieces. The Referee was directed in the rules to “more or less frequently” provide information to each side in the game, representing these as reports received from “prisoners, deserters, spies, people of the country, newspaper reports, rumors, etc.” It was specifically noted that the information thus conveyed to the players “may be reliable or not, according to circumstances.” The Referee was advised to draw upon his experience and limit the information to the kind normally received from such sources and was reminded to avoid favoring either side. The only reconnaissance or intelligence assets controlled by the players were the infantry and cavalry units that could mount patrols across the map. In any case, Totten wrote that “no disputes will be allowed in the game room” while spectators “will…be governed by the ordinary rules of game etiquette, and, unless appealed to by the Referee, avoid all interference in the run of affairs.” The rules also barred discussion of an ongoing situation in the game during any intervals or interruptions in play. Strategos: The Advanced Game set out a 14 step standard game turn in “Table A.—Order of Procedure” (one of several charts mounted for ready reference during play). Referee announces and records the beginning of a new interval [turn] and whether it is one minute or longer. Referee notes the continuing effect and consequences of any actions from previous turns. Player-Commanders, acting in turn, state their orders (written if necessary) and intentions for this turn to the Referee. The Referee and assistants execute all thus-indicated moves that require no die rolling. They also note the dispatch of messengers or scouts, any initiation of fire, and the receipt of orders, messages, spies, etc. The appropriate tables are consulted and the related calculations made in preparation for a die roll to determine whether the Player-commanders’ “orders and intentions” can in fact be implemented. The dice are now rolled [by the Referee and/or assistants] on the basis of the completed calculations and the appropriate table to determine which orders and/or intentions can be effected. The Referee and assistants now implement as necessary any orders and/or intentions determined by the die rolling to be possible, executing any movements now determined possible. Losses due to distant fire are now calculated using the appropriate table and the losses recorded upon the playing pieces, or the pieces are removed whenever sufficient casualties or other results require it. The chances for success in hand-to-hand combats beginning this turn or already in progress are now calculated by the Referee and recorded. Referee determines which ongoing hand-to-hand combats or rushes by units into hand-to-hand combat range end in this turn and identifies those clashes that will continue into the following turn. Final victory or defeat in those hand-to-hand combats ending this turn is determined by the Referee with a die roll and reference to the appropriate table. Pieces representing defeated units are turned face down and the defeat recorded. 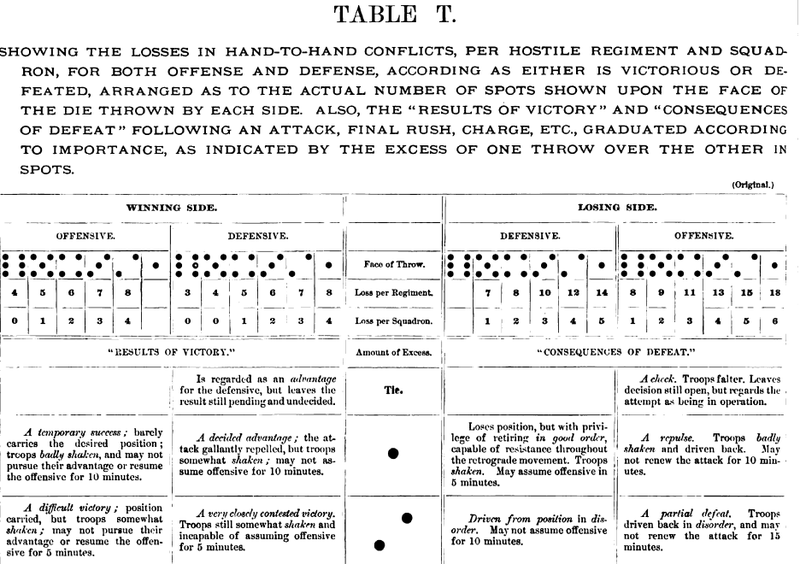 Losses in all hand-to-hand combats are now calculated and recorded on those playing pieces that remain in play (i.e., not removed from the table either as no longer effective or as destroyed). All final results and consequences arising from this and previous turns are now effected and recorded, and those that will affect future turns are recorded. Final corrections are called for and the turn declared closed by the Referee. 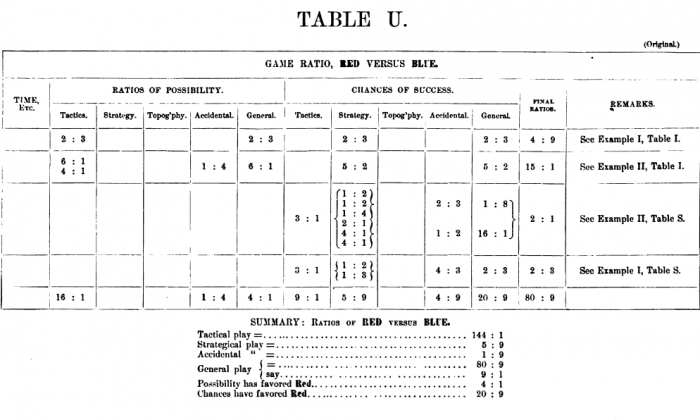 Unlike most modern, especially commercial, war games in which a unit’s movement capability is indicated on the playing piece or is standard for all playing pieces, most 19th Century rules provided tables stating the movement over a set time period under various circumstances. Since only the Referee or his assistants were allowed to move playing pieces, the tables represented only a reference guide for the players as they planned their maneuvers. 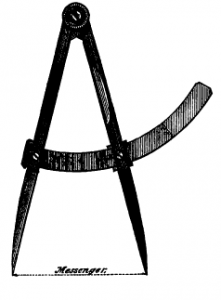 The accompanying apparatus included calipers or Measuring Dividers to assist the Referee in quickly executing the movements ordered by the Player-Commanders with scale markings on the curved arm to assist at correctly setting the interval of movement. Cavalry may move even when adversely affected by gradients of plus/minus 5°, 10°, 15°, 20°, 25°, and 30°; but only charge up a 5° or 10° slope and it loses its formation as the slope increases. All proposed movements ordered by the players were to be reviewed by the Referee to determine whether they were actually possible, referring to the rules and related tables. Orders were also reviewed for consistency with new or still applicable previously issued orders to the relevant units. The rules emphasized that neither Player-Commander could change a previously issued order until such time as information reached him warranting a change. The Referee was enjoined not to accept any orders that did not meet these criteria. The Referee would place known enemy units on the opposing commander’s map only when a courier conveying the information of their presence had reached the commander, unless, of course, the enemy units were judged to be directly visible by the commander or forces under that commander’s immediate control. Friendly units in Strategos: The Advanced Game were accepted as having taken all ordinary security precautions during movement, such as putting out advanced guards and flankers as well as sending out scouts. The Player-Commander was still expected to indicate the location of a unit’s outposts, as noted before in connection with the preparation of written orders, and this required him to designate which units would provide the outposts and how many, raising the kind of command issues Totten intended the players to deal with. There were few limits within the rules on how detailed a player could make his orders. Since the Player-Commanders usually represented a corps or a division commander and players possibly a brigade or even battalion commander, they had only indirect control over combat situations since that control was exercised through written messages to the subordinate on the scene (unless the Player-Commander was actually considered to be present at the point of combat). The Referee and any assistants would ‘fight’ subordinate units in accordance with any applicable orders issued by players in command roles or existing US Army doctrine of the period. As in other 19th Century games, Strategos: The Advanced Game depended upon the Referee’s judgment supported by Table I – Of Possibility To Advance, Retreat, Maintain Position, etc. to determine movement possibilities for units. 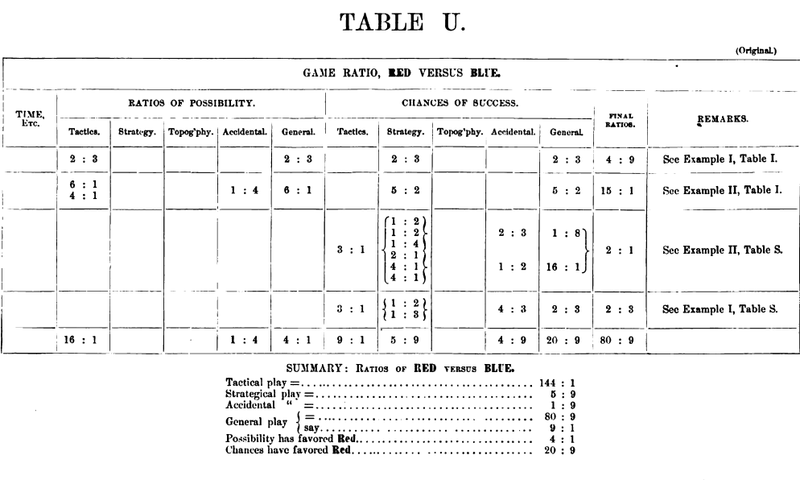 TABLE I’s two and one half pages presented 36 possible situations and the related odds of chance with the Referee determining from the game situation which side was Red and which Blue in the Table’s situations. The stated odds reflected the chances for or against a unit in one of these 36 situations successfully carrying out the proposed action, such as holding a position, advancing, retreating, firing, or charging the enemy, among others. If an action other than one of these 36 stated situations was proposed, the Referee would identify one of these 36 actions that had sufficient similarity to the new situation as to suggest the odds to use in determining the outcome. Three companies of Skirmishers (Blue) advancing in the open to attack a battery of Artillery (Red), already in action but not under cover, and the Skirmishers have arrived within 350 yards unchecked. Is a further advance possible? Percentage of losses for Skirmishers equals 15. Case 4, TABLE I, fixes the odds for two companies advancing in this manner as 3:2 in favor of Skirmishers. So far as numbers (strength) are concerned…., the ratio (odds) is 3:2 also in favor of the Skirmishers. Hence, applying Rule, we have Blue: Red: 3 x 3:2 x 2 = 9:4. However, if the outcome will affect other aspects of the game and having established the odds as 2:1, the Referee consults TABLE J since the ratio is 5:1 or less. To use Table J, one six sided die is thrown. The resulting die roll identifies the vertical column that is then cross-referenced with the previously determined odds ratio, in this instance 2:1, to find the horizontal row and the result where they intersect. In Example I above, a die roll of 4 indicates that the victor is the side having 2 chances [versus 1 chance], i.e. the Blue skirmishers defeat the Red artillery battery and are able to continue their advance. If the die gives a result of 0, the die is rolled again. Having determined that the odds are 5:1 or greater, the Referee refers to TABLE K to determine whether two or three six sided dice are to cast and the key result of the die roll. 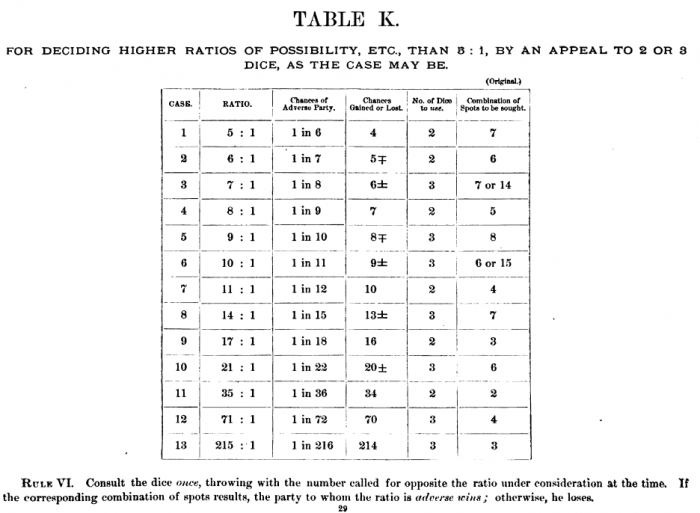 The right hand column of the table states the number to be rolled if the side disadvantaged by the stated odds is to be declared the victor. If any other number is rolled, the side holding the advantage in the odds ratio is the victor. Let the ratio be 35:1 in favor of red (identified by the Referee). Consulting the table opposite this ratio, we find that two dice must be thrown, and a combination amounting to two spots must be sought. The rules noted that a case may arise when it will be necessary to use certain “approximations” in order to use TABLES J and K. The designer expected such approximations to favor one side or the other and the Referee is encouraged to favor the weaker side in applying them. While Strategos: The Advanced Game offered guidance in the form of tables and additional rules to help determine combat outcomes, the rules also stated that these were not absolutely binding on the Referee. The rules encouraged the Referee to use his own discretion in deciding whether to follow the rules or to depend upon his own experience and authority. When the Player-commander advised the Referee of his intention to have a particular unit fire, he stated the character of the fire and estimated the range between the firing unit and the target unit. The accuracy of this estimate was taken into account by the Referee in determining the base effectiveness of the fire. The Infantry Fire results table is based upon the fire of a 100-man company in skirmish order firing for one minute against another 100 man infantry company standing in two ranks in line of battle. the 1 (applied to the row beneath “Heavy Fire”) identifies the right hand column to be cross-referenced with the known firing range to indicate the resulting casualties. [are they infantry, cavalry, artillery, or engineers? Quality versus Quantity of fire concentrated upon a target. Influence of uphill or downhill slopes. Are there earthworks or other engineering works, walls, or vegetation providing cover? Are there any Engineer Works in Progress? Is the Ground in Front hard, soft, plowed, or broken by rocks or earth? What material is used in any cover – earth, brick, wood, stone? [fresh, to some degree shaken, in disorder or even confusion, routed, enthusiastic, flushed with victory, or successful?]. Are the troops acting with Efficiency, Diminished Rapidity, Special Modifications, etc.? A Blue artillery battery is under direct Red infantry fire from 200 men in heavy skirmish order at 400-500 yards range – what are the battery’s losses during five minutes? The Referee determines that the skirmishers fire is “Ineffectual Fire” giving a base result of 13 casualties on Table M (above). 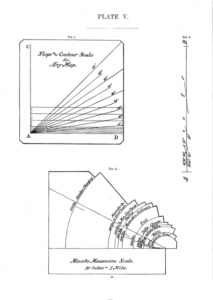 A review of Table R of Multipliers shows that Cases 9 (Cannoneers), 16 (Heavy Skirmish Line Firing), 54, (Less than Standard Number Firing) and 62 (Duration of Firing) apply, giving respective modifiers of 1/15; 7/8; 2/1; and 5/1. Consolidating the modifiers as follows: 1/15 x 7/8 x 2/1 x 5/1 = 7/12 and 7/12 of 13 equals 7 7/12 rounded to 8, or about 1 KIA and 7 WIA. And to determine the number of horses lost by the artillery to this infantry fire, the Referee applies Cases 7 (Horses) instead of Case 9 (Cannoneers) as above: 2/3 x 7/8 x 2/1 x 5/1 = 35/6 and 35/6 of 13 = 76 horses killed or wounded beyond use. A battery of Red artillery coming into action receives enfilade fire from a half-battery of three Blue 12-pounders at a range of 1,500 yards. Range being known, what are the Red casualties from 3 minutes of fire? Referee determines that it is “Heavy Fire” and the effect according to Table O – Of Casualty. Losses Per Minute, Occasioned by the Fire of One Battery of  12-PDRS. Against an Infantry “Line of Battle” will be 46 men lost. To determine the final loss, the Referee determines the applicable modifiers from Table R Of Multipliers to be Cases 5, 9, 47, 54, and 62. Thus it is 1/20 x 2/1 x ½ x 3/1 = 3/20 and 3/20 of 46 = 6.9 or 7, i.e. 1 killed and 6 wounded. The loss of horses was recorded in pencil on the accompanying caisson piece while the losses in men were recorded on the battery piece. A foot battery had 115 horses and needed a minimum of 36 to remain fully effective. Having fewer than that number would result in the loss of one caisson, and an additional caisson would be lost for each additional loss of two horses. With only 25 horses, the artillery abandoned all caissons if the battery was to be moved while the loss of two more horses resulted in the abandonment of one gun. An additional gun would be abandoned with each further loss of four horses. When a total of 112 horses had been lost, the battery would be immobilized. A similar process applied to the Hotchkiss Revolving Cannon and Gatling Gun batteries, which had 62 horses. 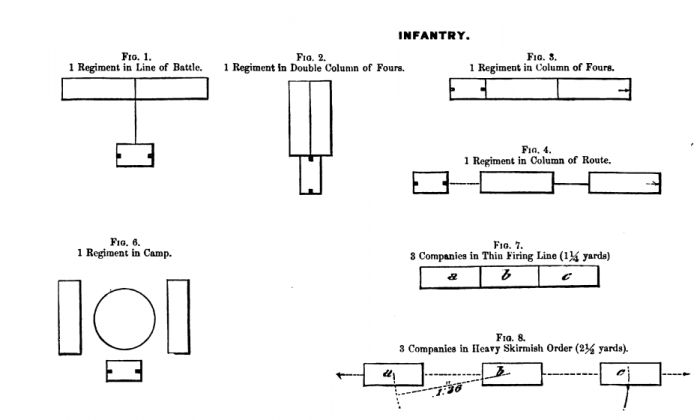 Infantry or cavalry company pieces would be removed upon the loss of 50 men – half of its strength. Casualties were also recorded on Table W for the General Record of Losses, Captures, etc., like Table B for keeping track of the passage of time, Table W was mounted on soft wood or pasteboard. Red and Blue pins recorded the respective sides loses during play. Of course, copies of Table W could also be used with pencil for the same purpose. The Referee must first determine if the hand to hand clash would occur, would it be resolved in one turn of play, and finally determine the outcome of the resulting clash. 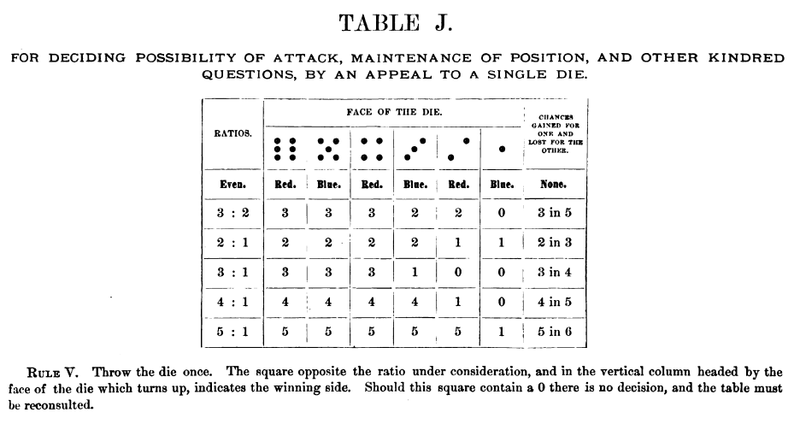 Totten again offered examples to illustrate the use of the Table S Chance of Success and Table L Of Duration. What are the chances of success in this case? Whom do they favor and when shall the conflict be decided? Calculated as Blue: Red – 2 x 3 x 1 x 3 : 1 x 1 x 3 x 4 = 18 : 12, or 3 : 2, the final chances favoring Blue. As to duration, as Blue is the offensive party in this example, a final roll as this odds ratio that favored Blue would also be an immediate decision of this engagement. The Referee then turns to determining Results and Consequences using Table T.
A second proffered example presented a more complicated and extended combat. A regimental column of Red Infantry, within five minutes of a previous victory though “shaken,” is attacked in front and flank by two battalions of Blue Cavalry, in line and fresh. However, a Red Cavalry battalion, apparently unnoticed in support, attacks the Blue Cavalry in turn in flank, although the Red Cavalry is disordered by the difficult ground. What are the chances of success in this compound case? Whom do the chances favor and when shall the matter be decided? To determine if the engagement ended now, the Referee combines the two results into a general ratio 8 x 1 : 1 x 16 = 8:16 = 1 : 2 favoring Red. The Referee then referred to Table J For Deciding the Possibility of Attack, Maintenance of a Position, And Other Kindred Questions, rolling a single six sided die against the 2:1 row which offered Red four out of six chances of successfully ending the engagement now. Having concluded the close combat either in the first phase or a subsequent phase, the Referee next determined the consequences or casualties resulting from it. For this, he consulted Table T Showing the Losses in Hand-to-Hand Conflicts, Per Hostile Regiment and Squadron, For Both Offense and Defense, According as Either is Victorious or Defeated, Arranged as to the Actual Number of Spots Shown Upon the Face of the Die Thrown by Each Side. Each Player-Commander or Player representing the two sides engaged in the combat will in this instance take up a single six-sided die and make as many throws as the odds favoring him in the presence of the Referee alone. The Offensive side in the engagement would go first. To determine the effect of each die roll, the Referee had to consider whether or not the Player throwing the die was victorious or defeated, and whether attacking or defending. The resulting die roll would give the loss per regiment or per squadron per minute of duration of the melee, while the differential between the two players’ die rolls would give the victor the fruits of his victory while the loser received the consequences of his defeat. The Referee then determined whether new troops would be entering the game and might that entry in some way incite new fights. Losses resulting from melees caused by charges were recorded and the possibility of these losses leading to further movement would be assessed. The Referee reviewed the movement of couriers, etc., computed their movement and determined whether any messages would be delivered. All that was left to complete the turn would be to adjust the various indices and other markers to show the passage of time associated with the just completed turn. This would also be the moment at which the Referee might offer suggestions to one or both commanders with regard to their conduct of the game in the remaining turns. The last turn of the game would conclude with the Referee declaring the problem solved, the naming of the winner, and discussion of the problem and the game just completed. This method can be used in addition to the use of “Table U. Game Ratio, Red versus Blue,” pictured below, which provides a place for a detailed record of combats and other actions during the play of the game. It is based upon the principle that the logarithm of the product of two or more numbers is equal to the algebraic sum of the logarithms of such numbers. 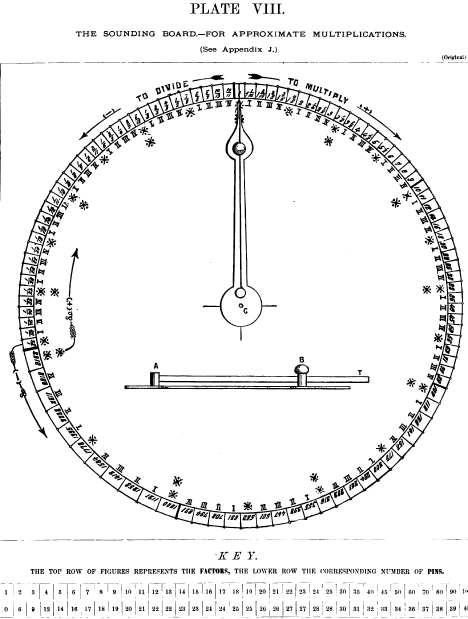 The instrument consists of a dial, around which is arranged a logarithmic series of numbers, the spaces between them being marked by vertical pins placed upon an exterior arc. An index arrow, A B, is pivoted at the center, C, of these concentric circles, and may be moved by means of a handle near its other extremity, so as to point at any part of the inner circle of the dial. The handle of this arrow is provided with a spring tongue, T, which projects beyond its point far enough to reach the pins arranged around the exterior arc, and to click as it passes such pins. The series of numbers arranged upon the inner arc is derived from the equation y = (2 log. x)10, in which x = any number used as a factor or a divisor, and y = the corresponding number of pins. Thus, let x = 2, then the log. x = taken to two places = 30; 2 log. x = 60; and y =(2 log. x) 10 = 6. Therefore, to multiply by 2 upon such a board click forward the pointer 6 pins. Suppose, for instance, the arrow pointed at 112; to multiply that by 2, click forward 6 pins and the arrow will be found pointing to 224. Table L.—Of Duration. Maintenance of Position Under Fire, Continuance of Condition, Morale, Etc. (Foreign Tables altered, enlarged, and brought down to date.). Table O.—Of Casualty. Losses Per Minute, Occasioned By the Fire of One Battery of  12-PDRS. Against An Infantry “Line of Battle.” (original). Table P.—Of Casualty. 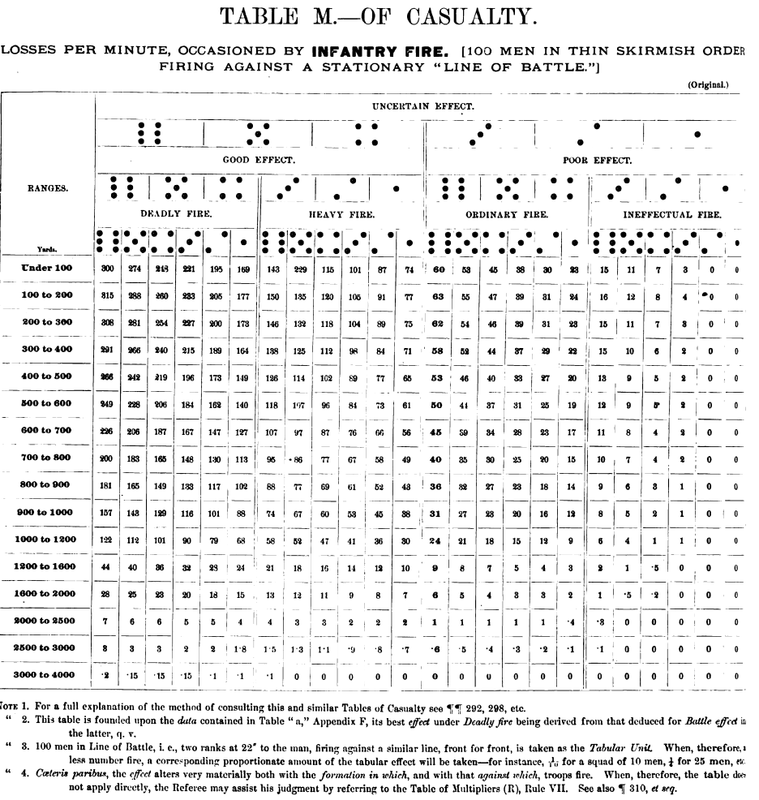 Losses Per Minute, Occasioned By the Fire of One Battery of  3” Rifles Against an Infantry “Line of Battle.” (original). Table Q.—Of Casualty. Losses Per Minute, Occasioned By the Fire of One Battery  of Hotchkiss Revolving Cannon [Cal. 11/2”], At 30 Yards Interval, Against An Infantry “Line of Battle.” [Stationary]. (original). Table R.—Of Multipliers. For Use In Consulting Tables of Casualty. (original calculation). Table S.—“Chances of Success.” (Foreign Tables altered, enlarged, and brought down to date.). Table U. Game Ratio, Red Versus Blue. (original). Table 1.—For Recording Losses and Captures. All of these 19th Century games are primarily battle games though they can replicate what today would be called the operational level of war. The only events envisioned by the game designers, the referees or umpires, and probably by most of their players, were those expected to take place in the vicinity of or actually on a battlefield, or otherwise in association with the activity of armed troops. There were no provisions for the inclusion of socio-political or economic events of any kind, nor for interaction between military units and civilian populations. It would not have been impossible for the Referee to have introduced such elements, but it seems highly unlikely that it would have even occurred to him given the focus of these games. 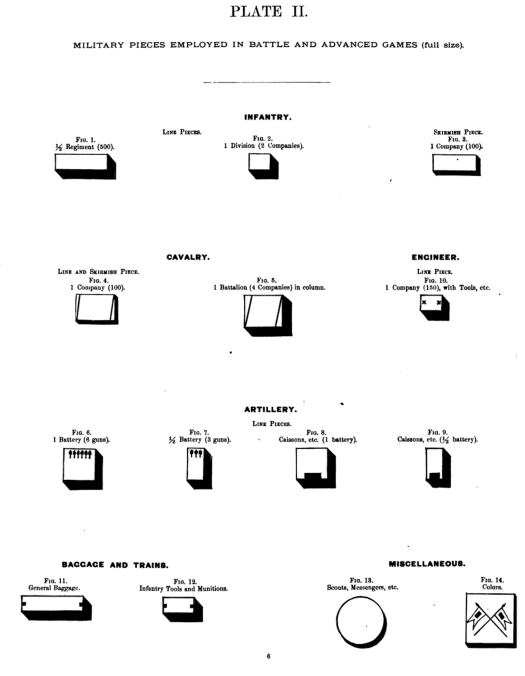 All the games, including Totten’s, presented the players with two comparable armies armed with identical weapons, leaving it up to the scenarist to introduce any kind of asymmetry or imbalance of forces and possibly capabilities. The consistent purpose of the games, especially emphasized in the Prussian game but surviving into these later games, was to instruct the officers playing the game in the art of decision making in rapidly changing circumstances and on the basis of limited information. The fact that Totten was more successful than Livermore in attracting favorable notice from the War Department may, in my view, have more to do with personality than timing or any other factor. Totten’s Foreword to Strategos appears to be an incredible exercise in name-dropping as his thanks to a listing of officers that includes Major-Generals Hancock, Schofield, and McDowell among other notables of the time and goes on for an entire page. For modern historians and wargame designers, both American Kriegsspiel and the two volumes of Strategos present pages of notes and tables [Tables to the Appendices] filled with the relevant military minutiae of the day. 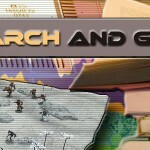 For that resource alone, the two games are well worth examining and are available over the internet. Totten’s claims for the unique qualities of Strategos do not, in my view, stand up under examination. In most aspects, his game is similar to its contemporaries in mechanics although he may make lighter demands upon the mathematical skills of his Referee and players than Livermore does in American Kriegsspiel. The elements of his apparatus follow all of the same principles of design, save for the slate-silicate surface that replace the informational markers of Livermore’s game system. And yet, Totten also presents us with a more game-like wargame than the others since, for example, players were actually permitted to handle and roll dice (though only in the presence of the Referee and not each other). And the game apparatus included the 12-sided teetotum, translated today into the much beloved and maligned 12 sided die! Sure – are you on Facebook? You can pm me there or via Dunnigan’s milgroup on yahoo if you’re a member there.